The new Honda Insight, just revealed moments ago, might not be as flashy some of the other concepts here at the 2008 Paris Auto Show, but it is arguably the most important one. The new Insight is a volley straight across the bow of the Toyota Prius, and with a rumored starting price of $18,500, it may be the critical hit which sinks their hybrid market dominating battleship. Thanks to that cheap entry point, it's hard to imagine this car as anything but a runaway success. 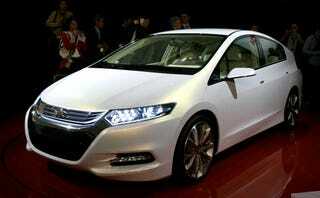 Honda thinks so too, as the automaker will begin sales of the all-new Insight in Japan, Europe and North America in spring 2009, and projects annual global sales of 200,000 units. Our take and the full press release, below the jump. This new Honda Insight concept borrows more from modern Honda hybrids than it does from its namesake, one of the first hybrids available for sale in the US. Despite that early availability, the early car was only a two seater, wasn't particularly speedy at the on-ramp, and lacked certain creature comforts modern car buyers expect, hybrid or not. With this latest iteration, all of those complains are vanquished, with a full five passenger seating capacity, a large cargo area, and as many creature comforts as you want to check on the options list. Will the new Honda Insight be the one to bring some real competition to the dedicated hybrid market? We're tending to think yes. However, we'll have to wait till its biggest direct competitor, the redesigned 210 Toyota Prius, drops at the 2009 Detroit Auto Show. Honda Introduces All-New Insight Dedicated Hybrid Concept Vehicle at Paris Motor Show PARIS, France, October 2, 2008—Honda Motor Co., Ltd. presented the concept model of its all-new Insight dedicated hybrid vehicle scheduled to be introduced in 2009, at the 2008 Paris Motor Show (October 2–19; Press Days: October 2–3). Based on a theme of achieving dynamic performance through excellent aerodynamics, the exterior design of the Insight concept model combines excellent environmental performance and a fun to drive spirit. The compact Insight Concept measures 4,375 mm (172.2 in.) in length, 1,695 mm (66.7 in.) in width, and 1,425 mm (56.1 in.) in height, with specially designed, ultra-light aluminum wheels and 205/40 R18 tires. With a cockpit that enables the driver to experience the joy of driving, the interior of the Insight Concept provides an advanced and futuristic feeling that is possible only through a hybrid vehicle. The all-new Insight, which will be developed based on this Insight Concept, will be a five-door, five-passenger hatchback equipped with Honda’s lightweight and compact hybrid system, with a 1.3-liter gasoline engine serving as the main power source, assisted by an electric motor. While achieving fuel economy on par with the Civic Hybrid, the new Insight will also achieve excellent utility and light and comfortable driving through the adoption of a new platform developed specifically for this vehicle. Honda will begin sales of the all-new Insight in Japan, Europe and North America in spring 2009, and projects annual global sales of 200,000 units. In his speech at the Paris Motor Show, Honda Motor president & CEO Takeo Fukui said, “This new Insight will give more people the chance to get behind the wheel of a high quality hybrid vehicle only Honda can develop.” The name Insight was chosen to denote that this new vehicle provides "insight" into a new era in which hybrid vehicles come within reach of most car buyers.